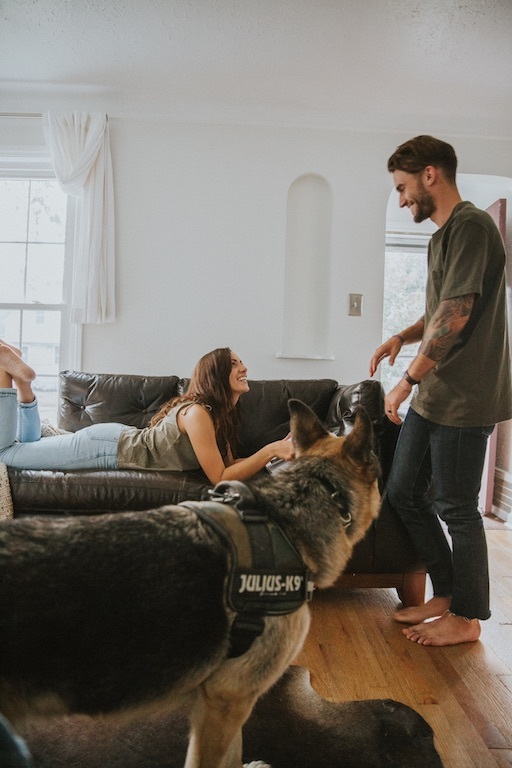 When Christine first met Shawn, they spent their weekends painting, thrifting and fixing up his first home — a tiny foreclosed bungalow in Cleveland, Ohio. They got married and over the years, the little fixer-upper transformed into a beloved home for their friends, pets and even houseplants — of which they have hundreds. Flash forward to 2017. A new, larger property essentially fell in their laps. It would need extensive renovations — an exciting challenge for the young couple. They rolled up their sleeves, determined to give the new home the same love, time and attention as their first. Unfortunately, their contractor had other plans. 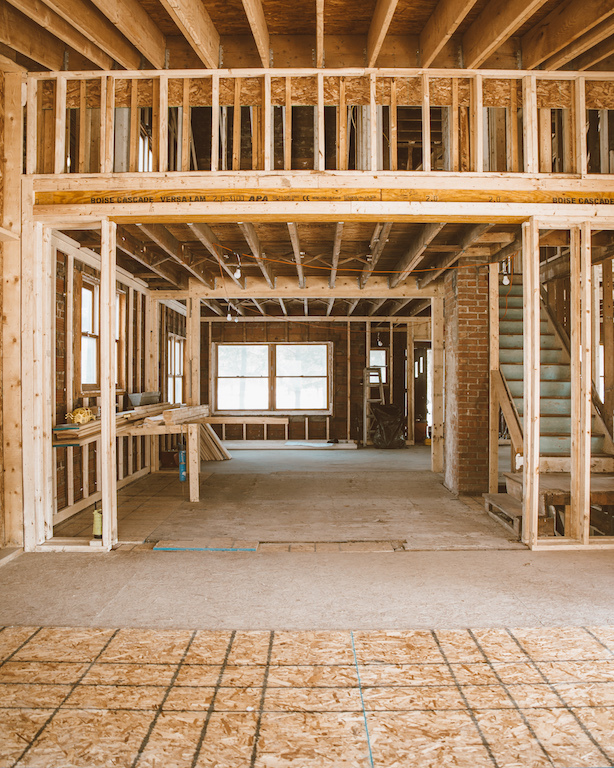 After a year of working on the house — with alarming delays and mishaps along the way — the city revoked the builder’s license, he filed for bankruptcy and a building inspector came and confirmed that all of the work (electrical, HVAC, plumbing and more) was completely wrong. Christine and Shawn discovered they were caught in the middle of a year-long scam and the project fell apart over the course of three days. With the knowledge that they would not be getting their money back, they pressed on — intent to make right what had gone terribly wrong. As a general rule, contractors want to work with you, not against you. While the overall industry is trustworthy, you can learn a lot from others’ experiences with the few bad apples who don’t have a homeowners best interest in mind. 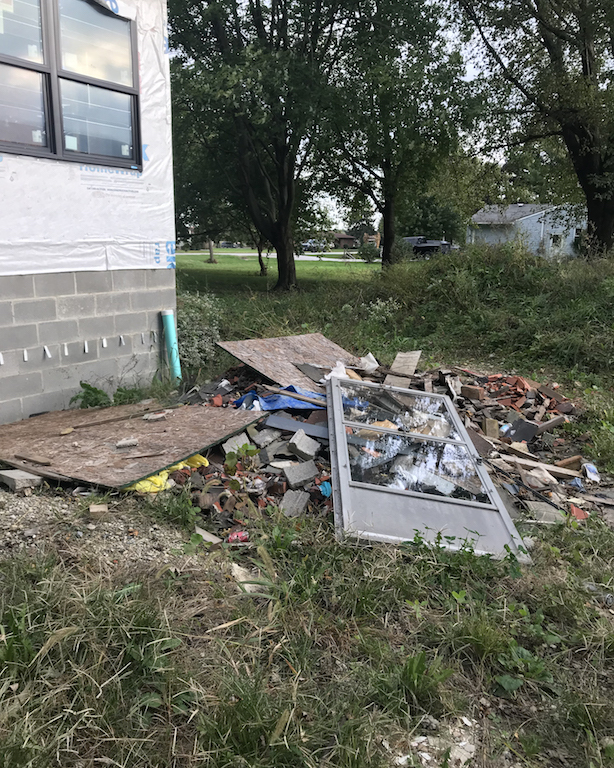 To help would-be reno’ers identify these red flags, we interviewed Christine about what they learned from this unfortunate experience and how they got their renovation back on track. Livabl: How did you find your house? Christine Higgs: We weren’t actively looking to move but in the spring of 2017, my dad called us over to look at a piece of land he was interested in purchasing. 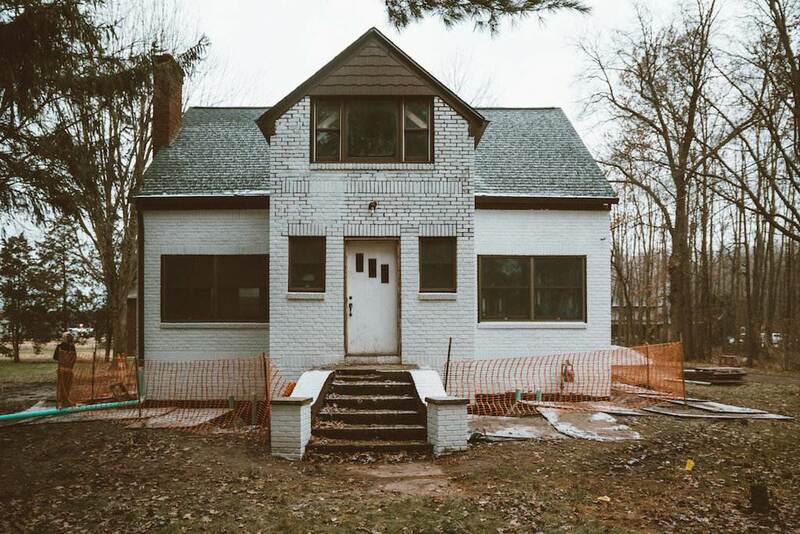 At the front, there was a charming brick home that hadn’t been touched since the 1940s. My dad had no use for it and he didn’t want to tear it down. Instead, he asked if we wanted to fix it up. He had a vision of all of his kids living on this property. We would be the first to move in. The house was completely broken down. It had never been maintained or updated. We also didn’t feel that the square footage was being utilized to its fullest potential. If we wanted to live there, there was no other option but to renovate it. Shawn and I saw so much opportunity for the house from the get-go, it was literally meant to be. L: Were there any signs along the way that helped you realize you were caught up in a scam? CH: We were lied to for a full year. Eventually, it got to a point where there were so many excuses, we were questioning everything he said. For example, he said the work wasn’t getting done because one of his main workers was in the hospital. He sent us a picture of his worker in a hospital bed. When I saved the photo to my camera roll, the image data showed the photo had been taken the year before. The work also generally looked wrong and sloppy. I learned from this experience that if something doesn’t feel right, it probably isn’t. Don’t hesitate to call your city’s building department and have an inspector come to check the work that’s being done. L: What were the main areas that had to be redone? CH: After meeting with the city, we had pages upon pages of things we needed to correct before we could get the renovation up-and-running again — calculations to confirm the support beam was correct, we had a giant hole on the exterior of the house and basement that needed to be bricked, a flooded basement and a whole addition that wasn’t properly attached to the house. Everything has since been corrected by different tradespeople. An early red flag was that he didn’t purchase the windows we had requested. In the end, the windows were confirmed incorrectly installed by the city. Some didn’t even meet fire code. Thankfully, he had only installed five and now we have what we wanted in the first place. L: Is there anything homeowners can do to protect themselves financially when contractors don’t come through? CH: You can build in an incentive for finishing early or a penalty clause for not finishing on time if your contractor agrees. This is something worth bringing up, especially when you are in the negotiation part of your agreement. Also, make sure your contractor has a license in your city and a contractor license bond. Our old contractor was licensed and we didn’t get anything back, but it’s still another thing you should verify before signing a contract. L: What is your advice for homeowners looking for a contractor? CH: I learned so much from this experience, especially from talking to the many contractors that walked through our house and saw the disaster we were left with. I learned that if it sounds too good to be true, it probably is. Another piece of advice is to get at least three to four bids from contractors. When you get your bids, you will have a super low quote, a middle quote and a high quote. I personally advise you go with the middle quote (as long as they are credible — do your research before signing anything). For example, Shawn and I got quotes for bricking the exterior of the addition. One was $3,500, one was $9,000 and one was $15,000. We went with the middle quote from our current, trustworthy contractor. It’s your forever home, don’t be afraid to be picky. Ask for multiple samples, renderings, quotes — anything your heart desires. L: You’ve learned so much about your home from this process. What features are you most excited to see come together? CH: Woo! Now some exciting things to share. 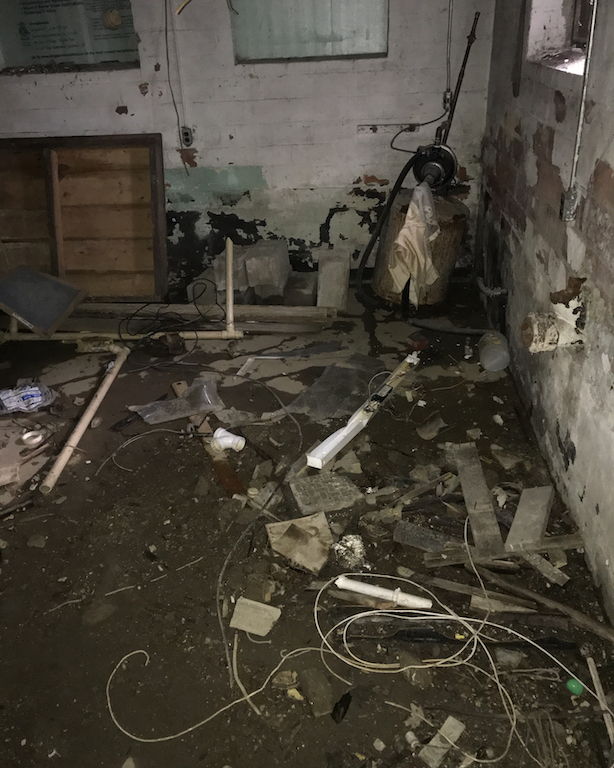 After everything happened, we gutted the place and saw so much more opportunity, mainly for the second floor. 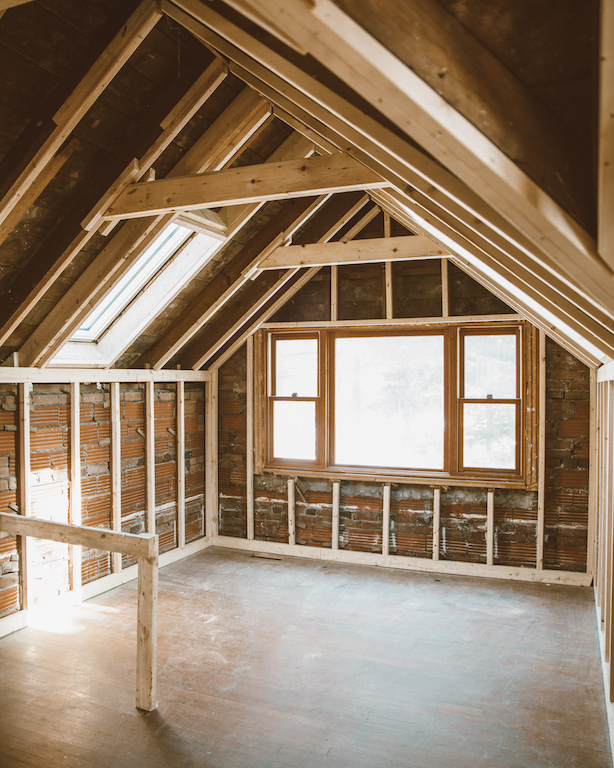 Our bedrooms went from being one of the least exciting parts of the renovation to one of our favorite features of the house after an architect confirmed we could remove the ceiling joists and have vaulted ceilings throughout the second floor. We’re so excited about the new addition and can both visualize our family hanging out in the kitchen and the great room. We’re going to have a nine-foot long kitchen island that leads into an open great room with giant windows. It just screams ‘happy place’ in my heart. We’ll enjoy beautiful meals, natural light, stylish furniture, and plants — lots of plants.